The Sega 32X is a video game console developed by Sega. 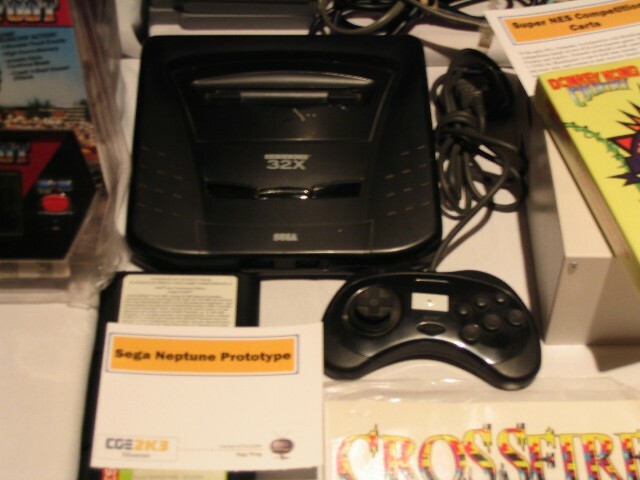 In Japan, it was distributed under the name Sega Super 32X. In North America, its name was the Sega Genesis 32X. In Europe, Australia, and other countries that use PAL, it was called the Sega Mega Drive 32X. Most gamers, for simplicity's sake, refer to it as just the "32X". With the release of the Super Famicom in Japan and the SNES in North America, Sega felt the need to leapfrog Nintendo in the technological department. The Sega Mega-CD, known as Sega CD in North America, had not worked as well, in a business sense, as Sega had wanted it to. Sega had various developments underway, and focused most of its energy on the then new Sega Saturn. Some used System 16 technology, as the Sega Mega Drive and other arcade games did. The 32X was released on November 21, 1994 in North America for $159, Japan on December 3, 1994 for ¥16,800, and Europe in November 14, 1994 for £170 / DM 400. The Sega 32X can only be used in conjunction with a Mega Drive/Genesis system. It is inserted into the system like a standard game cartridge, although it does require its own separate power supply, among other things. Besides playing its own cartridges, it also acts as a pass through for Mega Drive games, so it can be used as a permanent attachment. The Sega Virtua Processor based Virtua Racing is the only exception - the game will not run on a Mega Drive with a 32X unit attached due to its processor. (There was an enhanced version of the game available for the 32X, however.) Also, Sega's Power Base Converter, which allows one to play Sega Master System games on a Mega Drive/Genesis, could not be used with the 32X attached. This is because the Power Base Converter uses all of the connection pins in the Mega Drive/Genesis itself, but the 32x only passes through those connections that are necessary to play games. The 32X came with a spacer so it would fit properly with the Mega Drive II. It could be used with the Sega Multi-Mega/Sega CDX system, but the spacer would not accommodate the CDX, which created a number of user-unfriendly conditions in the unit. Without the use of the spacer on a Mega Drive II, some of the 32X hardware was left exposed and vulnerable. The combined unit was also very prone to tipping over, risking damage to the unit and games. In addition to the physical problems, there was also an issue with FCC approval. Most 32X games cannot be played unless the distribution region of the game matches the region of the console. A few games are not locked and can be played on a console from any region (e.g. FIFA 96). Two games, Darxide and FIFA Soccer '96, were only released for the PAL 32X. All but one of the games released for the Japanese market were released in the United States, albeit some had different names. The one Japanese-only game was Sangokushi IV (known as Romance of the Three Kingdoms IV). In addition to regular cartridge-based 32X games, there were also a very small number of CD-ROM games for the 32X. These games were labeled with Sega Mega-CD 32X (Sega CD 32X in North America). As the name suggests, these required both the 32X and Mega-CD/Sega CD addons. The lack of a significant userbase due to the high cost of purchasing all three necessary components saw only five games released, only one of those developed by Sega. The most notable of these was a new version of the infamous Night Trap with 32,768 onscreen colors instead of the 64 found on the regular Mega-CD/Sega CD version. One little-known aspect of the 32X was its vastly improved audio subsystem, known as Q-Sound and developed by QSound Labs. While this theoretically gave the system audio capabilities that outstripped even the Super NES, the sound chipset proved to be poorly documented and exceptionally difficult to program for. As a result, most games ignored the Q-Sound system and used the Mega Drive's on-board sound chip, thus leaving the 32X's audio capabilities largely untapped. To this day, emulators still have difficulty providing sound emulation for the few titles that did make use of the Q-Sound system. On January 8, 1994, Hayao Nakayama, then CEO of Sega, ordered his company to make a 32-bit cartridge based console that would be in stores by Christmas 1994. This would at first be named "Project Jupiter", but after Sega found CD technology cheaper, they decided to modify it instead of dropping the cartridge project (that would be called "Project Saturn"). Hideki Sato and some other Sega of Japan engineers came over to collaborate about the project with Sega of America's Joe Miller. The first idea was a new Mega Drive with more colours and a 32-bit processor. Miller thought that an add-on to the Mega Drive/Genesis would be a better idea, because he felt that gamers would not buy an improved version of the Mega Drive/Genesis. And so, this project was codenamed Project Mars, and Sega of America was going to shape the project. The 32X was primarily envisioned as a system which would extend the life of the Sega Genesis and provide revenue while the installed userbase of the Sega Saturn slowly grew. The video-gaming public first got a glimpse at the Summer 1994 CES in Chicago. Players highly anticipated the system. The console was unmasked as the 32X, with a price projection of $170), at a gamers' day, held by Sega of America in September 1994. Only 500,000 consoles had been produced for North American consumption, yet orders were in the millions. The console allegedly had numerous mechanical problems. Games had been rushed for the system in the run up to Christmas 1994. Some early games came with errors in programming, causing crashes and glitches on certain titles. Other games required leaving out parts in order to make the Christmas deadline; for example, the 32X version of Doom is missing almost half the levels present on the PC and even the Super Nintendo version; plus, Doom 32X was criticised for having worse sound than the Super Nintendo version. Many complained that their 32X was not working with their Mega Drive/Genesis or television and Sega was forced to give away adapters. Since this was an expensive add-on system, Sega decided to offer a £50 discount on games with the console in Europe. However, the offer came in the form of rebate vouchers, which were difficult to take advantage of. Just like its North American counterpart, this console was initially popular. Orders exceeded one million, but not enough were produced, and supply shortage problems arose. By mid-1995, the time the Sega executives realized their blunder, it was too late. Developers and licensees had abandoned this console in favour of what they perceived to be a true 32-bit console, the Sega Saturn. Even though the 32X was a 32-bit system, the games did not appear to take full advantage of 32 bit processing; many games were rushed and produced in 2D. Many were just slightly-enhanced ports of Genesis or old arcade games such as Space Harrier. In reality, as stated by Steve Snake, creator of NBA Jam, NBA Jam T.E. and Mortal Kombat II were seriously pushing the console even though they looked like minor enhancements. He cites that people were expecting far too much from it, and over-hyping from magazines had helped to hurt it. Due to successful marketing, customers perceived the Sega Saturn, Nintendo 64, and the Sony PlayStation as the true next-generation consoles, due to their rich launch titles and 3D graphics. Also, customers perceived that Sega abandoned the 32X despite promises to the contrary, due to the launch of the Saturn. Console makers, prior to the launch of PlayStation 2, would often abandon platforms and offer no backwards compatibility with older systems. For this reason, Sega's 32X customers felt cheated because of the apparent lower quality of the games, and the inevitability of obsolescence. Store shelves became littered with unwanted Sega 32X systems, and prices for a new one dropped as low as $19.95. (Some have claimed that video game exchange stores became so filled with 32X systems, the stores refused to accept the console--even at no cost.) Sega planned a console named the Sega Neptune, which would have been a Mega Drive/Genesis and 32X in one. However, by the time a prototype was developed, the Sega Saturn was going to be released, and Sega canceled the Neptune. The last game made for the 32X in the US was Spider-Man: Web of Fire (1996). The last ever 32X game was Darxide, which had been intended by Frontier Developments to be a launch title for the ill-fated Neptune. Both these games now command a high value from collectors — but especially Darxide (up to $1000) due to its scarcity, reputation and auspicious creator (David Braben, co-writer of the groundbreaking game Elite). Nevertheless, it is exceeded in rarity by the European PAL versions of the games Primal Rage and T-Mek. For obscure reasons a mere handful of copies of these games are known to be in circulation - with T-Mek being so scarce that until a copy surfaced on eBay in late 2005, it was widely held that the PAL release was only a rumour. The appearance of a copy has fuelled speculation that other rumoured but unconfirmed PAL games may also exist, in particular BC Racers. One game that was a success was Knuckles Chaotix. Based on the Sonic The Hedgehog series, the game was praised by critics for having better-looking sprites (Which looked like Sonic CD), and two player connectivity, which a lot of the other 32X games had. But even with the demand from fans, the only re-release so far has been through Gametap's PC service (But there's also a whole section of art in Sonic Gems Collection, so a port on that game might of been involved, but later removed). For many years prior, console makers promised devices like the 32X that would extend and enhance the original system. The 32X was the first product released that fundamentally altered the original console's abilities. However, deficient in software titles and lacking the 3D capabilities the gaming community demanded, the add-on technology represented a dead end, ultimately punishing early adopters. Ignorant of the idea that console systems' primary strength is in standardization, Sega had created three different platforms (the Sega Mega Drive, and the Mega-CD/Sega CD and the 32X add-ons) all under the same banner, stealing valuable shelf space from itself and confusing both vendors and consumers in the process. The entire episode demonstrated that producing such add-ons is likely to have detrimental effects on a system's brand marketing strategy. The final nail in the coffin for the peripheral came in October 1995, when Sega's CEO, Hayao Nakayama, ordered that the 32X and other Sega consoles be cancelled in order to focus its limited resources on the Saturn system. The Sega Neptune was a two-in-one Mega Drive/Genesis and 32X console which Sega planned to release in 1994 or 1995. The proposed retail price for the unit was $200. Sega had admitted how expensive and problematic the 32X was, so it was decided to make a combined version of the Mega Drive/Genesis and 32X; however, by the time a prototype came out, the Sega Saturn was ready for release. Sega felt that consumers would not be interested in the Sega Neptune, so the project was scrapped. There are several prototypes, and at least one was declared to work. Electronic Gaming Monthly used the Sega Neptune as an April Fool's Joke in its April 2001 issue. The issue included a small article in which the writers announced that Sega had found a warehouse full of old Sega Neptunes, and were selling them on a website. The site referenced redirected to an online shopping site, where internet users were greeted by an "April Fools!" after adding the product to the cart. This page uses content from Wikipedia. The original article was at Sega 32X. The list of authors can be seen in the page history. As with Sega Wiki, the text of Wikipedia is available under the GNU Free Documentation License.